England's Euro 2008 qualifying campaign stuttered again with a dismal stalemate against Israel in Tel Aviv. 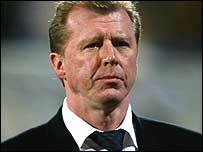 Steve McClaren's side drew a blank once more, and it was another lifeless performance from England. Israel keeper Dudu Aouate twice saved well from Frank Lampard, with Jamie Carragher heading against the bar and Andrew Johnson just off target. Teenage striker Toto Tamuz posed a threat for Israel, forcing Paul Robinson into a save and heading wide. It was hardly surprising that some of the 4,000 England fans in the stadium chanted 'What a load of rubbish' in the closing stages of the bore draw. England named the expected line-up, with Everton striker Johnson partnering Wayne Rooney up front. But he had little chance to shine in a dismal first 45 minutes in which few clear chances were created by either side. Lampard had England's best opportunity after he got in on the end of a neat build-up between Johnson and Steven Gerrard, but Israel keeper Aouate plunged bravely at his feet. Israel's main danger in the opening exchanges came from youngster Tamuz, who forced Robinson to dive low to his right to save and then sent an angled header just wide from Ben Shushan's cross. Aaron Lennon's pace was a good outlet for England, but there was a desperate lack of real creativity from McClaren's side. England had a scare after 54 minutes when Yossi Benayoun played in Pini Balili, but he shot wide on the turn. Lampard tested Aouate again just after the hour, and when the keeper fumbled his powerful volley, Rooney clashed with Tal Ben Haim as they chased the loose ball. A bout of bumping and barging between the pair ended with both receiving the yellow card from Norwegian referee Tom Ovrebo. Lampard then flicked a header across the face of goal with Rooney only inches away from connecting. As England's pressure mounted, Johnson directed a header off target from a superb Gerrard cross. Jamie Carragher almost emerged as the unlikely figure to break the deadlock after 68 minutes, heading Lampard's corner on to the bar. England made their first change with 19 minutes left, sending on the more attack-minded Micah Richards for Phil Neville. Jermain Defoe was then sent on in place of the hard-working Johnson as England attempted to fashion a breakthrough. Defoe's introduction almost reaped instant dividends when he fired in a close-range drive, but once more Aouate was equal to the task. The Spurs' striker had a header in the net in the dying seconds, but it was ruled out because he was clearly offside. Israel: Aouate, Ben Haim, Gershon, Ziv, Benado, Spungin, Badir, Benayoun, Ben Shushan (Alberman 87), Tamuz (Barda 75), Balili (Sahar 69). Subs Not Used: Davidovitch, Golan, Toama, Antebi. England: Robinson, Neville (Richards 72), Ferdinand, Terry, Carragher, Gerrard, Lampard, Hargreaves, Lennon (Downing 83), Rooney, Johnson (Defoe 80). Subs Not Used: Foster, Barry, Carrick, Dyer. Comment: A poor man's Eriksson? How was Wembley for you?